There is a strong demand for locally raised and processed meat in New Hampshire. We all enjoy knowing where our food comes from and in many cases the farmer who raised the food. However, current challenges limit the availability and affordability of locally produced and processed meat and poultry to residents. New Hampshire has hundreds of small pasture based beef producers, most of whom bring 50 or fewer animals for processing each year. There are only four USDA certified processing facilities and one non-USDA certified poultry facility in New Hampshire. The combination of hundreds of small producers and few processors results in scheduling challenges for processing during high season, high transportation costs, and high production costs. These infrastructure constraints limit the ability of producers and processors to meet the demand for affordable locally raised meat. This project will work with meat and poultry producers and processors to identify the challenges and develop strategies to reduce the cost of production and increase production. This website will be updated regularly and will include an online survey, a schedule of project meetings, and other opportunities for stakeholders to participate. Summaries of meetings will be posted on this site without attribution. Unlike other parts of the country, New Hampshire does not have large feedlots where livestock are confined and feed is brought to them. Instead, the vast majority of New Hampshire’s beef producers are small pasture based operations that process less than fifty animals a year. Ideally, these producers want conveniently located processing facilities to keep transportation costs down, processors with openings when they need them, and economical processing fees. Because many small beef producers want to slaughter their animals in the fall, it can be difficult to schedule an appointment when desired. Given that there are only four USDA inspected beef processing facilities in the State, there are many producers that need to travel long distances to access a processing facility. Many small meat producers are burdened with high transportation costs per animal because they haul a small number of animals long distances for processing. From the processors’ perspective, in order to operate they have made a large capital investment in equipment and other infrastructure and must maintain a skilled workforce to handle the products safely, legally, and according to customer specifications. New Hampshire’s small producers’ preference to slaughter during a particular season leads to seasonal spikes and lulls in demand for processors and challenging cash flow during slow times of the year. Processors need abundant and steady business throughout the year in order to stay profitable. Processors state that it would be helpful for the smaller producers to understand more about the nature of their business and schedule their services in advance throughout the year and commit to that date. Increasing communication and collaboration between producers and processors could lead toward increased production and processing of meat in New Hampshire. Although New Hampshire was a leader in poultry http://premier-pharmacy.com/product-category/cholesterol-lowering/ production in the middle of the 20th century, the poultry sector has greatly diminished during the last several decades of the century and most poultry producers are modestly sized. Due to operating on a small scale, New Hampshire’s thousands of small producers face a myriad of challenges to remain viable. While USDA has exemptions that allow on-farm processing of up to 20,000 birds raised on that farm, there are strict limitations. Since New Hampshire does not have a state inspection system, sales to stores are prohibited and poultry producers are limited to on-farm sales to consumers and highly restricted sales to restaurants. Poultry producers that want to sell their meat to stores must travel to a USDA inspected poultry facility in either Vermont, Maine or Connecticut. Between the regulatory requirements and the cost of transporting birds long distances to out of state USDA processing facilities, poultry producers who are interested in expanding their operations face significant hurdles. The project will begin with a series of focus group meetings with producers to identify challenges they face to reduce the cost of production and increase production. The project will also include focus group meetings with processors to identify the challenges processors face. Finally, the project will form a producer-processor working group to explore different models of production and seek efficiencies in the producer and processor relationship. A core principle of the project is that the producers and processors drive the process and develop the recommendations. Rather than have an expert’s recommendations in a report be met with an unenthusiastic or even skeptical reception from the producers, the producers and processors along with the guidance of technical service providers will develop the recommendations. The Environmental Mediation Center’s (EMC) is a non-profit organization that administers the New Hampshire Agricultural Mediation Program and agricultural mediation programs in three other states. 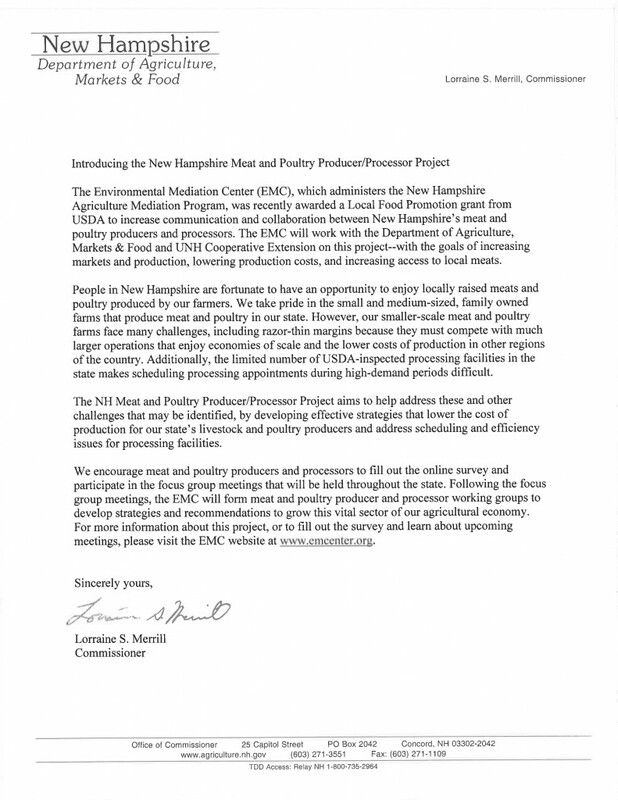 The EMC’s facilitation team will work closely with technical service providers from the University of New Hampshire’s Agricultural Extension Program (UNH Extension) and staff from the New Hampshire Department of Agriculture, Markets, and Food (NHDAMF). The EMC’s role is to facilitate a dialogue between the producers and processors and to weave the technical service providers and experts into the conversation when appropriate to provide advice. Ultimately the EMC will attempt to build consensus on a series of recommendations will was pre-vetted by stakeholders and experts to ensure that they are both effective and feasible. 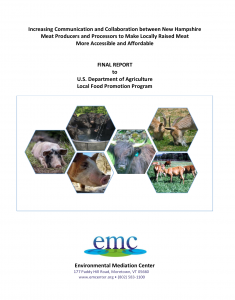 View the final report from the NH Meat Project Working Group. In January 2017, New Hampshire’s meat and poultry producers were invited to take part in focus group meetings (small discussion group) throughout the state. The purpose of the meetings was to identify the challenges producers face and discuss possible solutions and strategies to grow the industry. The information gathered from each focus group will be utilized by a working group to produce a report listing recommendations to be implemented.